Can you find what you're looking for in your desk drawers? 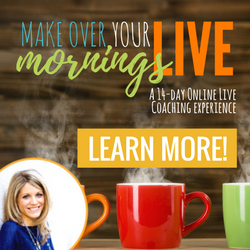 Or are you sometimes searching through overstuffed drawers for something? 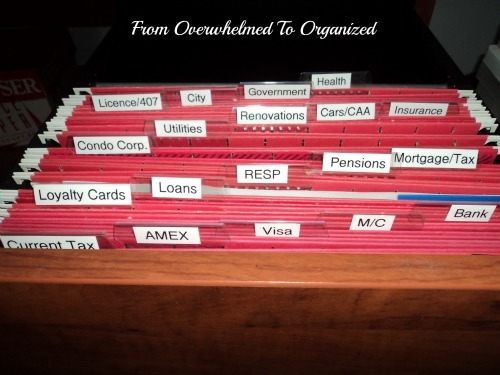 Do you feel overwhelmed at the thought of trying to organize your desk drawers? If so, then you've come to the right place! 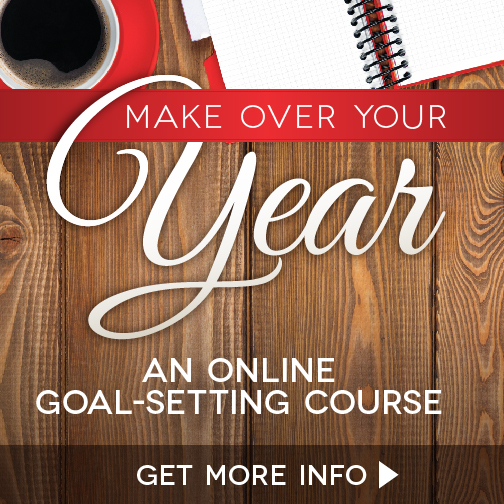 Rather than one huge post, I'm going to break this week's progress into a few posts so you're not overwhelmed reading them and you can actually remember the tips I share! 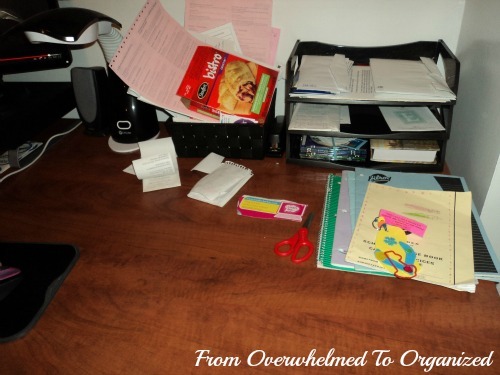 First, I'll show you how I de-cluttered and organized my dining room desk drawers. 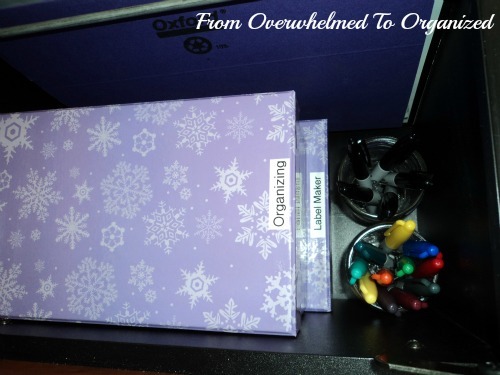 As I do, I'll share simple tips on how to organize your desk drawers so you can always find what you need. After spending so much time organizing the basement "office" the last few weeks, it was fun to tackle the dining room desk this week. Here's the top left drawer. This drawer was a mess of office supplies that were sort of organized at one point. But over time we kept adding things to this drawer, without really designating places for them, so it spiraled into chaos. Here it is now! I love the organizer tray so I just reorganized some of the items that were in it and flipped it around to make it a bit more functional. Some purging to the whole drawer and now it's much less cluttered. I even have space to put my stapler in the back part to get it off the top of my desk. Here's the bottom left desk drawer before I organized it. You can't even really tell in the picture how bad it is because a lot was buried on the bottom underneath those plastic bags. Trust me though... it was a disaster. 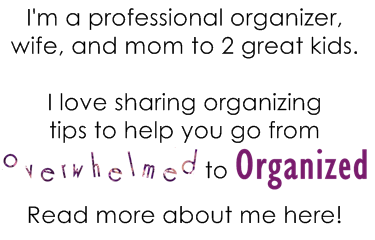 It's the one I'm in and out of the most for organizing and blogging, so I really wanted a touch of "me" to make it fun when I opened it up. So, I changed the files to pretty purple ones and added two purple boxes to contain some of the items that were loose in the drawer before. Pretty and functional! It's amazing how much more motivated I am to keep a space organized when it's pretty. 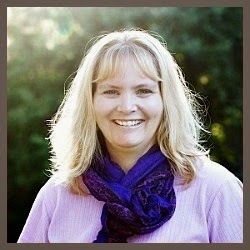 I don't want to go crazy (either with finances or with time) to make things pretty, but little touches go a long way! Aren't those markers cute in the jars? The boxes are nesting boxes so the bottom one is a little bigger than the top one, which is perfect so I can see the labels I put on them. Next up, the top right desk drawer. This drawer holds the kids' homework supplies. It actually wasn't in very bad shape. 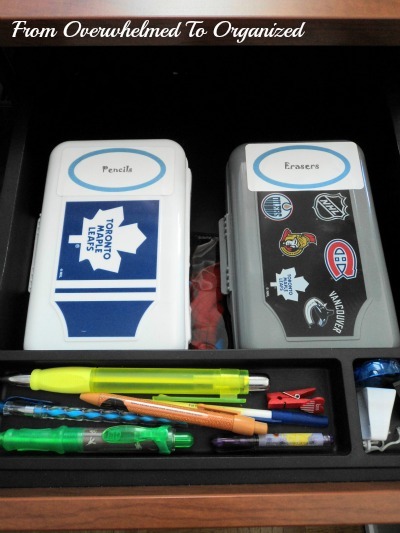 You may remember the pencil and eraser bins from when I organized my kids' activity drawers. It's been so effective having these two containers and the kids have been pretty good about putting everything back here after they finish their homework. As you can see, I didn't change it very much. I purged a few things and now there's some space at the back where I may add another container for pens at some point. 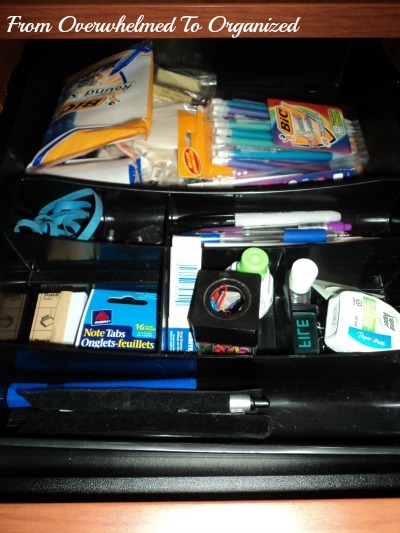 For now, the kids don't use pens very much so I'm just keeping them in the small organizer tray at the front, along with a few pencil sharpeners. Last up in this desk, is the file drawer that I organized earlier this month. As a reminder, here's how it looked at the beginning of the month. And after I organized it a few weeks ago. So why am I showing it to you again? Well, because I already changed it! Yep... I'm a little crazy. But as I worked my way through all these drawers, I re-thought how I wanted to use this one. 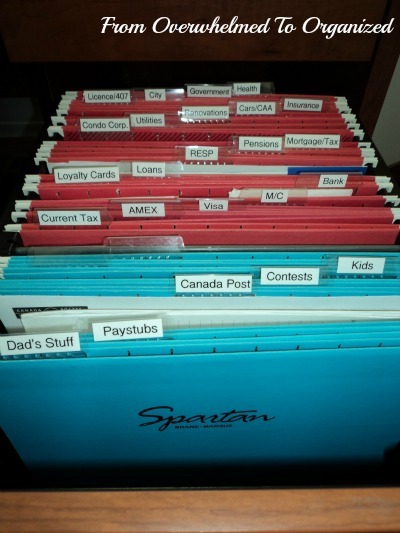 When I showed you this drawer a few weeks ago, I said I would use the space at the back for my business files when I start my professional organizing business. 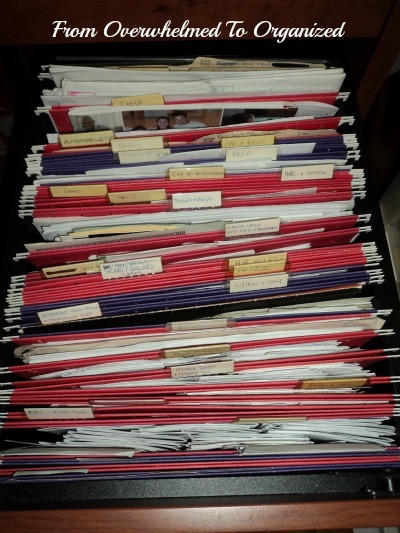 I'm now planning to keep those files in the other file drawer (the one I just showed you with the purple folders). 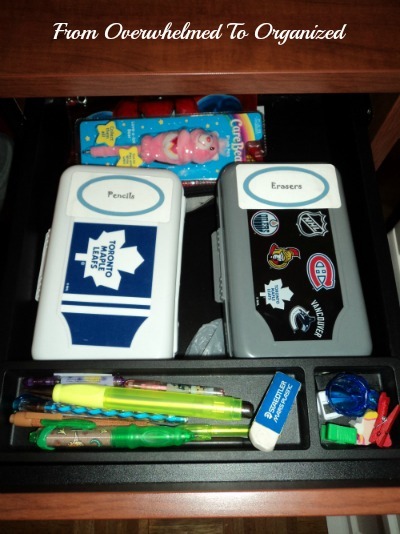 So now I can use the extra space in this drawer for some of my hubby's papers that were cluttering up the desk. 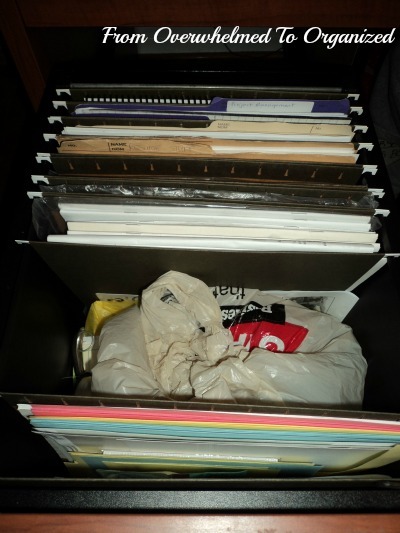 Remember the overflowing basket and all the bits and pieces of paper on the desk? It's gone now! Everything's in this drawer now. It's much more organized than having everything out on the desk! I also included a file for the kids to keep all their codes and websites and computer notes in so those aren't floating around on the surface of the desk. I've even got a few empty folders for my hubby to add to. We've got a bunch of papers in our bedroom that need to be sorted through and those we keep can be stored here, where it makes more sense to keep them. So, as a result of all of this drawer organizing, I've got a clear surface on the desk! I'll show you the full reveal in another post, but here's a sneak peak at part of it. It's so much nicer walking through the dining room now. I can't believe how much less overwhelmed I feel looking at this desk now! 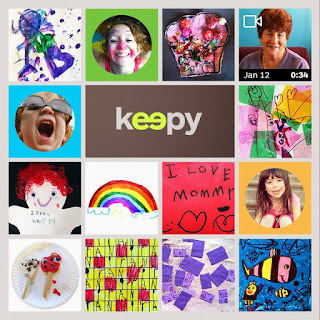 Make things pretty :) Don't go overboard spending lots of time, money, or energy on making things pretty, but add a few cute touches. It's amazing the difference it makes when you open a drawer and see pretty things in it and then you're more likely to keep it organized. Contain loose items. Nothing makes a drawer get chaotic faster than things floating around in it. Use drawer organizers, boxes, or shallow dishes to keep loose items contained. Group like items together. This is closely related to the previous tip, but it bears repeating. If you keep things grouped together you'll find what you're looking for quickly and will know where to put things back (which really helps your drawers stay organized too!). It also helps you know how much you have a particular item so you don't buy more when you don't need to. That's it for part one of this week's office progress! 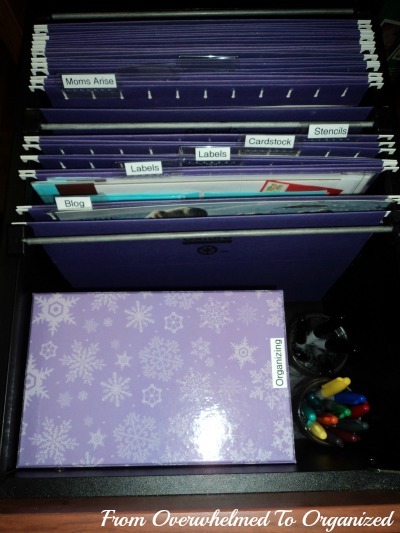 Next up, I'll show you how I organized the basement desk drawers. I'll also show you the de-cluttered bookshelves above the basement desk. Then I'll put everything together and do a big reveal of how both "office" areas look now. 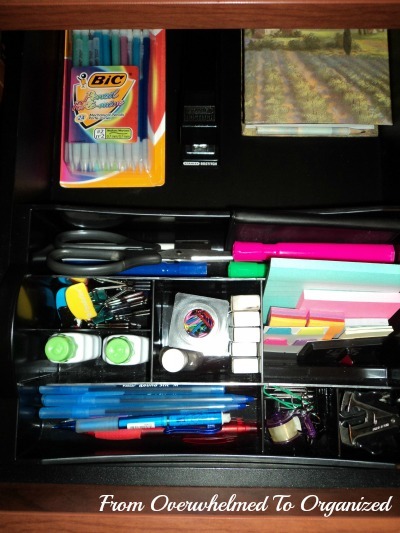 What do you find most difficult about keeping your desk drawers organized? 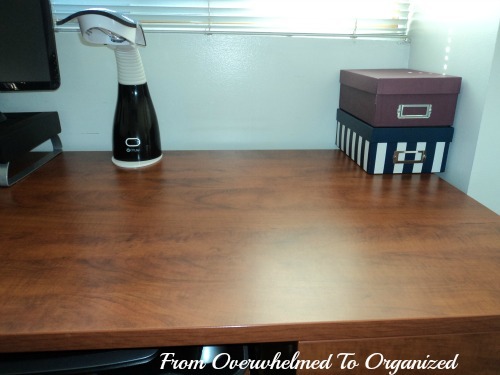 Do you have any tips for organizing desk drawers? If so, please share them in the comments!